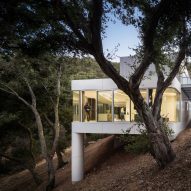 US studio Craig Steely Architecture has created a two-level home for a sloped site in northern California, with vast stretches of glass that overlook the treetops. 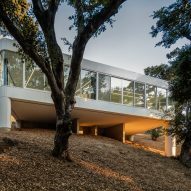 Nestled in the foothills of the Santa Cruz Mountains, the residence – called Pam and Paul's House – is located in Cupertino – the city where Apple has its vast headquarters. 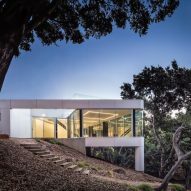 Built on a steep and wooded site, the 2,600-square-foot (242 square metres) dwelling was designed to minimise its impact on the environment. 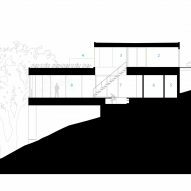 One side of the house hugs the hillside, while the other hovers over it, propped up by thick pillars. 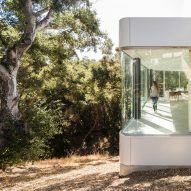 "The conceptual idea came clearly and quickly – float a glass box in the leaves of the trees on two trunk-like columns, disrupting as few oaks as possible," said American firm Craig Steely Architecture in a project description. For exterior cladding, the team used zinc and aluminium, along with large stretches of glass that are shaded by the dense tree canopy. On the upper level, mirrored glazing reflects the surrounding landscape and sky. The home is entered on the top level, where a steel-grate bridge leads to the north-facing front door and garage. 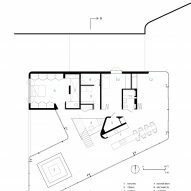 The upper level is composed of a rectilinear form adjoined to a sculptural volume, both of which are encircled by native grasses. While the lower level appears like a wide box, the south elevation actually cuts across the hillside at an angle. 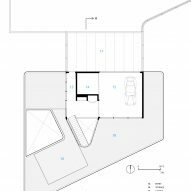 Curved corners accentuate the home's unusual massing. 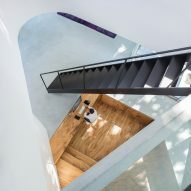 Inside, a metal staircase leads down to the main level of the home, where one encounters a light and airy space. Dark steel structural beams were left exposed, serving as a contrast to white walls, floor-to-ceiling glass and light grey concrete flooring. The northern half of this storey, abutting the hillside, encompasses bedrooms and bathrooms. The other half contains the public zone, which floats among the treetops and is filled with dappled sunlight. Within the open-plan public area, the team carved out portions of the floor slab in order to create distinct areas. 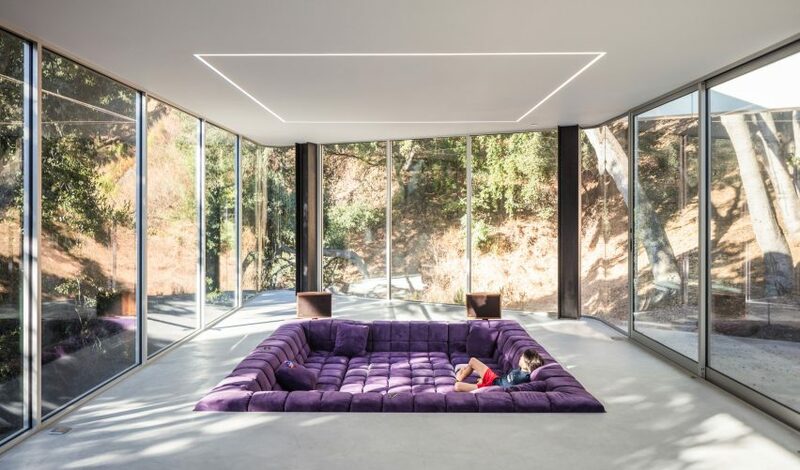 A sunken office sits underneath the stairs, while a plush purple sofa occupies a 144-square-foot (13-square-metre) sunken pit in the living room. A long strip of flooring in the kitchen was also extracted. Space was further delineated through the use of LED strips that are flush with the ceiling. "Strong geometric lines of light, reminiscent of a Dan Flavin sculpture, are clearly visible from the outside looking up through the leaves," the team said. Craig Steely Architecture, which has offices in San Francisco and Hawaii, is known for creating imaginative homes in challenging locations. Other projects by the studio include Lavaflow 7, a dwelling built on the slopes of an active volcano in Hawaii.